If I wasn’t afraid, I would fly to Toronto, sleep on a sofa and pound the pavement until I got a job publishing children’s books. Or I would hound a small-town mayor to let me job shadow her. Or I would plough through a teacher’s education program the next year and a half and gamble my chances at getting a classroom in Vancouver. Deciding what to do next with my life has been my biggest fear and its got me stuck. With so many ideas, ambitions, and internal pressures, I am having a hard time sorting out what is my reality. In the midst of this chaotic internal dialogue, I came across Sean Aiken’s bright yellow novel of creative non-fiction. In it I found my situation articulated better than I could do myself. So Aiken sets up a website and tells everyone he knows that he’s looking for a job per week. As the offers roll in, Aiken seems to be unable to do this project solely for himself. He announces that all wages he’d earn during the 52 weeks would be donated to charity. This is a noble offer, but not uncommon. Many people mask their self-exploration with a pledge to impact the greater good – the cyclists of Global Agents of Change who overcome personal mountains by pedalling from Vancouver to Mexico are just one example. I do not disagree with raising awareness or funds. Indeed, helping others while pursuing something for yourself protects us from complete failure: it ensures that at least some good will come even if we don’t reach our goal. But I have to wonder why we feel that adventuring into the process of understanding who we are as individuals cannot be done without fear of looking selfish. Anyway, I digress. I suppose I’m doing the same thing here, sharing through a public blog my thoughts on how this book affected me. Lately I’ve been taking every opportunity to ask people what they do for a living. I try to give folks the opportunity to define themselves in ways other than their career – “So what do you do when you’re not playing soccer/farming/being a city councellor/selling ad space?” – but I often want to hear how they get paid for doing what they love. 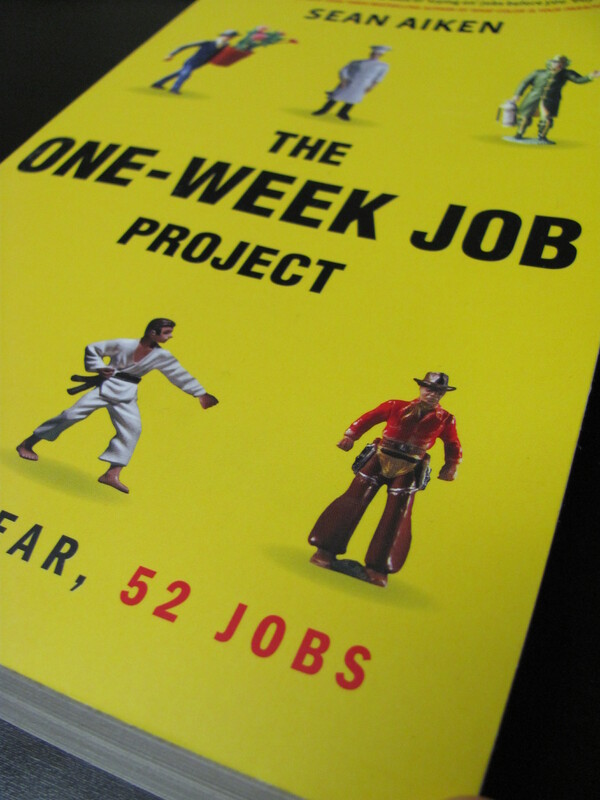 The One-Week Job Project is the information interview catalogue for which I’ve been searching. The “Industry IQ” sections and excerpts from Aiken’s email correspondence with potential employers were insightful and humbling. He shares anecdotes about each job that I’d likely only gain by being in the career myself. And this book has enough quotes to inspire (and offer a reality check to) any reader. As I got further into the book, talking about it with my peers and drowning in universally-applicable quotes, I started to get irritated by the repetitious conclusions Aiken came to after each week. I get it: people are scared, complacent, unadventurous. I was also following him on Facebook and it seemed that since the book was launched, he was really pushing the self-promotion. Fair enough, we all should be paid for our efforts. But I had to question his objectives behind the project: was he still doing the life-passion exploration thing or was he now exploiting the helping-others mantra? Also, I couldn’t get over his misunderstood grudge against his father. If Aiken was advocating about helping others when you don‘t know what else to do, why couldn’t he see that though his father might not enjoy his job, he enjoyed his career: putting food on the table and a roof overhead for his family. Ok, enough Jocelyn-as-devil-rep (my snobby-university/critical-theory habits are getting the better of me), I do have some good things to say about this book. I was initially sceptical of how well-timed his little love story was with this journey but I quickly changed my mind. When we’re looking for who we truly are, it’s not outrageous to find ourselves in others. We find similar-minded people as we follow our interests. Another helpful tip I got from Aiken’s experience is realizing that a job interview is a two-way conversation in search of a good fit for both the employer and potential employee. So, while looking for a career, look at what kind of life you want, who you want to be surrounded by, and what values you wish to have in common with them. I recognize that not everyone has the liberty to undergo a journey of self-exploration, weekly job samples, or even global travels. But a fundamental message that can be taken from Aiken’s book is that the pursuit of happiness can come in any job, any career, any vocation, hobby or greater mission. The people he met throughout the year all recognized the need to compromise but also have courage to take risks for what they really want. This book has been encouraging. It has alleviated some of my fears. Knowing that thousands of others exist like me, wondering how to make their lives significant, and knowing that thousands have taken chances and been just fine. Like the bungee jump analogy Aiken uses in the book’s opening: rationally, I know I will be fine no matter what I do in life. Even with a ‘wrong’ turn, it will be worth the chance. Because I will recognize that turn wasn’t right for me and I can move on to something else. I’ve heard it now countless times, and even from my own dad: “Just do something.” I have to agree.